Want to make Valentine Boxes this year that are insanely darling, but super easy and quick to put together? 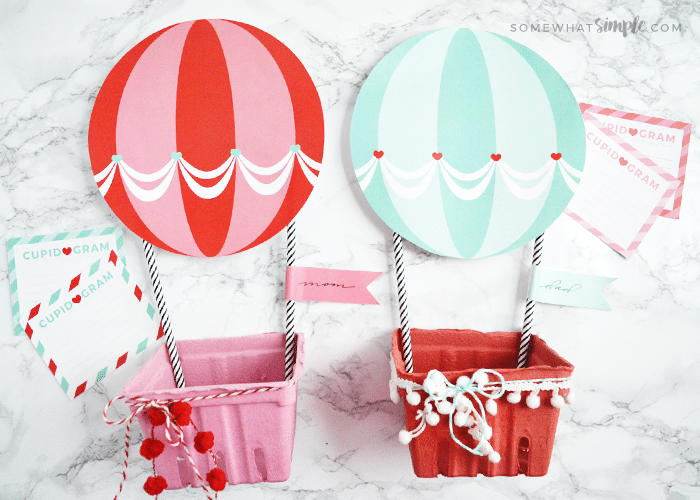 Then you have to check out this adorable Hot Air Balloon Valentine Box idea! 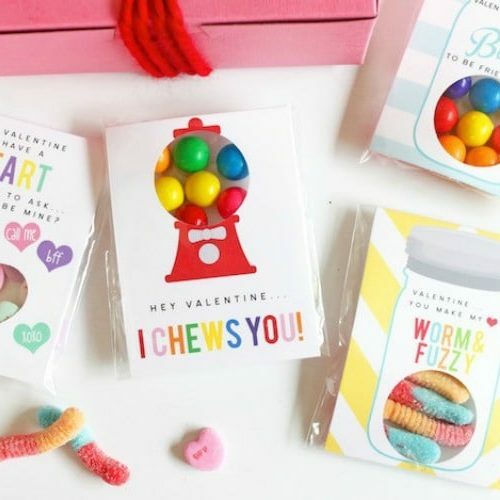 We’ve shown you some of our favorite printable Valentine Cards – ( We Make a Great Pair + Have a Ball + Yo-Yo Valentines ) – now we’re going to show you a fun mailbox to make so your kids can store all the cute cards they come home with! 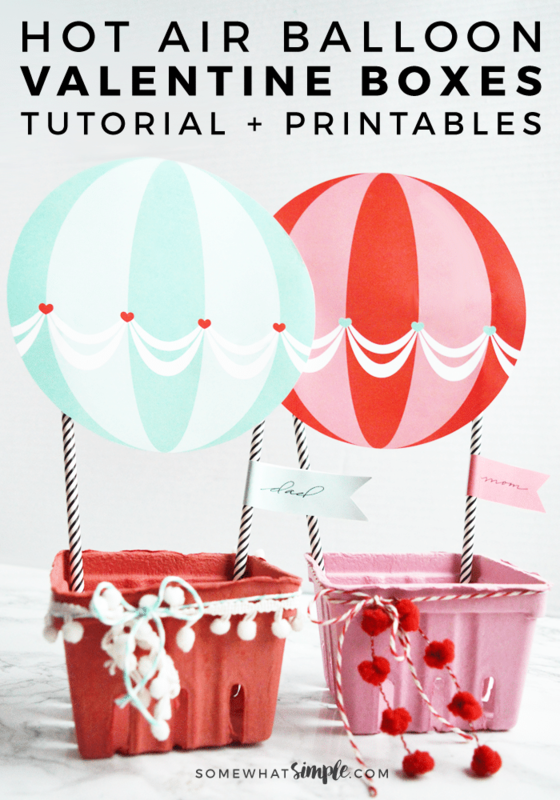 First, print off and cut out a Hot Air Balloon Valentine Box printable for each person. Write the name on the flag, and then glue around one of the straws. Hot glue or tape the straws onto the back inside corners of the basket. Hot glue or tape the balloon onto the tops of the straws. 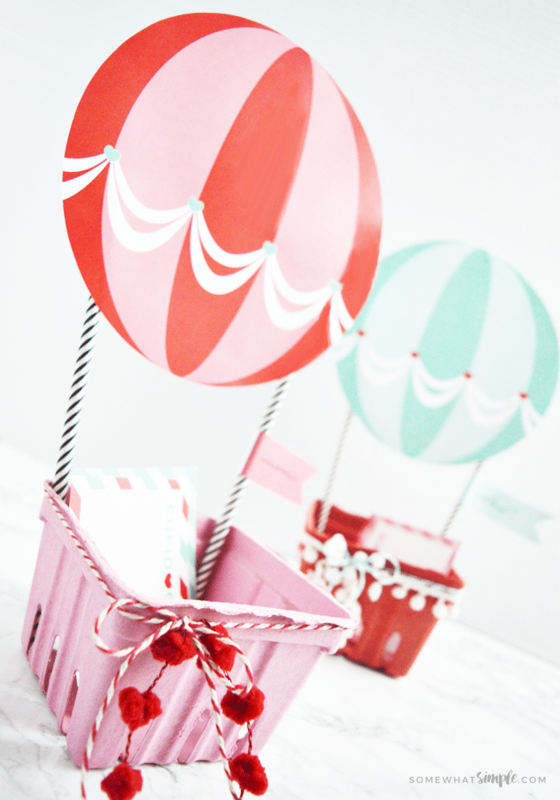 Embellish your basket with ribbons and string if desired. Optional: Fill out a Cupid Gram, and place inside the basket, along with treats or other Valentine’s goodies! 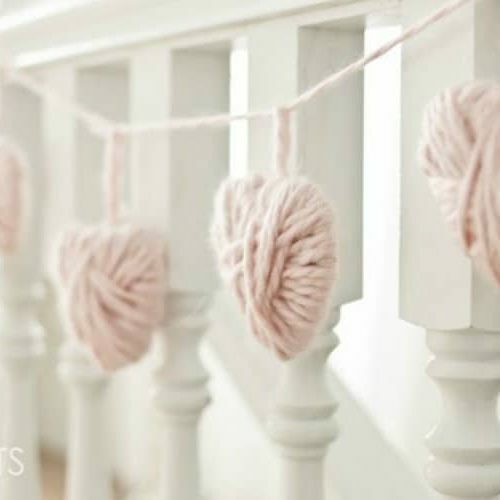 It really doesn’t get much simpler (or cuter!) than that! 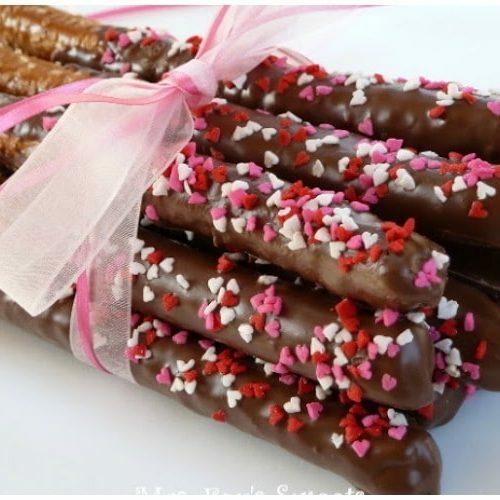 We are using ours for our family Valentine’s Day party – each person will have their own basket, filled with Valentines from Mom + Dad, plus little treats. 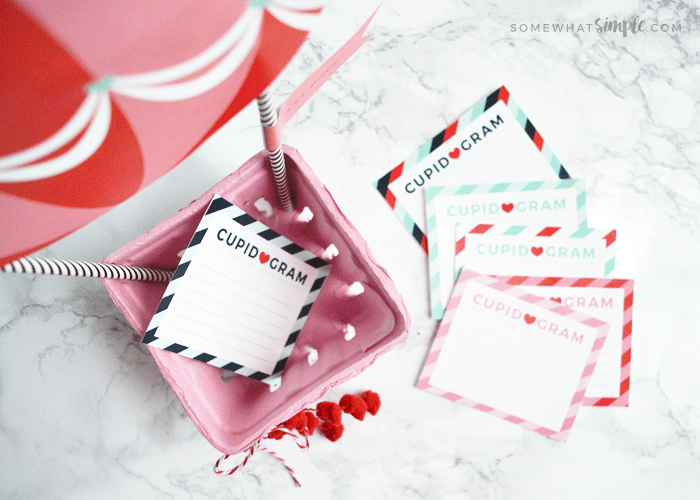 I’m planning on having everyone fill out a Cupid Gram for each family member – I’m always looking for ways that the kids can say nice things about each other. There is way too much arguing between them, so these little notes might get some eye-rolling from the older ones, but in the end, they’ll love it! Want to make these Valentine Boxes for your class or Family Valentine’s Day party? We are hosting a mini family get together and I was looking for a fun way to have their treats and mail. I wanted something different from the mailboxes we get every year, this was a “meant to be” with impeccable timing! I so love it and will love making them even more. Thank you for sharing the printable!!!!! I’m so glad you found them! I’m sure they’ll love them. Glee…that’s what these cute little boxes make me feel. Crazy adorable! 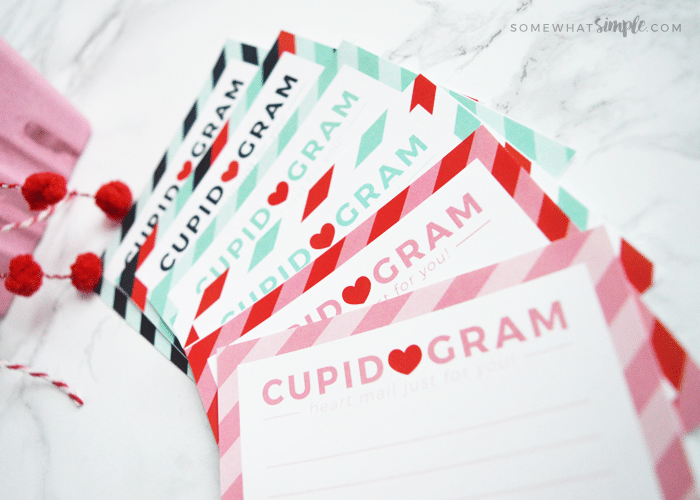 Omgosh these are SUPER cute! I love how they don’t take much at all but still look adorable. Thanks for linking up to the Friday Frenzy! I am dying over the cuteness of these! Thanks for sharing at Friday Frenzy Link Party! Pinned!! So glad you like them! Thanks for stopping by and Pinning this! I appreciate it!